It seems like the only topic in town has been Brexit but with the direction of where we are going still unclear, one sentence for me used post-referendum remains key. 'London is open', but, more than that, the UK remains open for business. Despite the macro-political situation, recruitment seems to be buoyant, if not flourishing in some areas. What is the reason for this? Firstly, there has been a boom in startup businesses with a particular focus on the technology sector. Recent reports have indicated that the number of new technology companies launched in the UK last year rose by almost 60%. Moreover, London continues to dominate the tech sector, playing host to more than 40% of the startups in the industry last year, meaning it ranked second, after Silicon Valley as the most connected place for tech in the world. 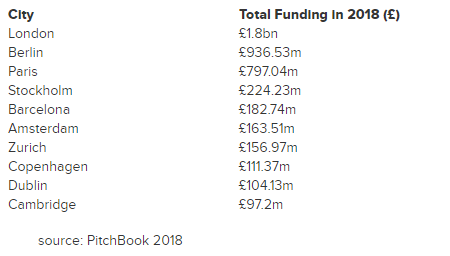 The following table shows the total venture capital funding into technology companies across major European cities in 2018. Employment, on the whole, is up, reaching more than 75% and unemployment down to below 4%. According to the CIPD the "proportion of organisations that currently have vacancies and report recruitment difficulties has increased to around seven in ten (70%) employers, compared with around six in ten organisations (61%) six months ago." Why has the UK performed so differently to its Europen friends? Is Diversity a factor? A McKinsey study found that a company with a diverse workforce outperforms the non-diverse ones by 15% (gender diverse) and 35% (ethnically diverse). The UK is an open place to work, we invite people from all around the globe and integrate them, we encourage excellence and we reward endeavour. In my experience, the UK's diversity is clear from the number of clients and candidates we deal with who are not British nationals. In the last year at Paritas Recruitment, 47% placements were not born in the UK and 21% were female. The willingness to integrate is clear and what is more, it's normal. Last year, Deloitte released a report titled 'Diversity and Inclusion in high growth tech' where it listed the startups which had the fastest growth rate. 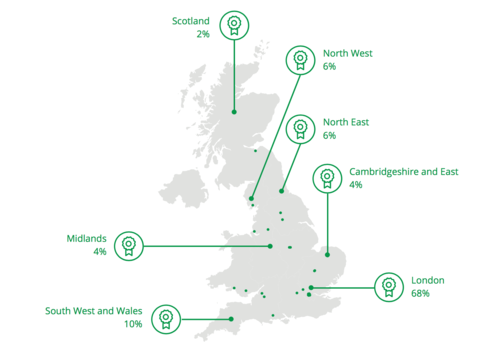 The following figure shows the top 50 tech companies in the UK by region. When we compared this to this list of companies which sponsored Tier 2 work visas, we witnessed, most of the companies have diversity and inclusion policy in place, along with 66% of granting sponsorships and having measures to attract the best candidates from where ever in the world. Back to the present and the UK parliament remains in a bind on both sides of the aisle, we have a government struggling to govern and an opposition that provides no real challenge or ideas beyond their push for a General Election which isn't in their power to achieve. The economic signals aren't rosy either from a global perspective; Paris is under siege, Germany & Italy are in a technical recession, there is a slowdown in China are who also is in the midst of a trade war with the United States. So what can we do to mitigate the above? I certainly don't have all the answers, but from a recruitment perspective, I have a simple idea. The Government needs to make it easier for businesses to hire and this means opening the Tier 1 and Tier 2 visa processes. This outlook is starting to change with the Home Office's recent announcement that it is doubling the number of exceptional talent in tech visas - from 1000 to 2000 and, from 2021, to allow a higher number of skilled Indian workers to migrate to the UK. I would like to ask the Government to go further, release the Tier 1 visa handbrake to more than just the tech sector and don't wait till 2021.